According to tradition, Dieric Bouts (ca. 1410/20-1475) received his education in Haarlem, which in that time period made up a portion of the territory of the Burgundian Philip the Good. Bouts came to Leuven in 1448, where since 1425, the first university of the Low Countries was founded. In the city full of towers of parochial churches and cloisters, a high level of building activity presided. The most important paintings that he made on assignment in Leuven, are the Triptych of the Adoration of the Magi , the Triptych of Saint Erasmus, the Altarpiece of the Last Supper (the latter two for the St. Peter's Church) and the Justice of Emperor Otto III . Quite early on, Dieric Bouts belonged to the upper class. He moved within Leuven's intellectual world and was one of the highest civil servants. Bouts's style is distinguished by harmonic compositions in a rich, clear and warm palette of colour. His figures are tall, statuesque and turned inwards. The presentations are hardly emotional. He is likewise called the ‘painter of the silence'. The realism and monumentality that are characteristic of the so-called Flemish primitives are also to be found in Bouts's work. His paintings exhibit thematic and compositional influence of Rogier van der Weyden, whose masterpiece The Descent from the Cross was still in Leuven at the time. 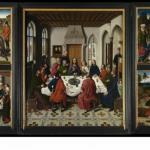 Bouts's precise observation and register of the reality clearly point towards Jan van Eyck. Bouts's two sons, Dieric and Albrecht, continued their father's artistic tradition far into the 16th Century. Other artists also were influenced by his work such as, among others, Hans Memling and Gerard David, as well as Southern and Northern Dutch, German, French and Spanish Masters. The Leonardus Altarpiece in the church in Zoutleeuw also shows a relationship to Bouts's style. Dieric Bouts was born in the Northern Low Countries, probably in Haarlem. It is presumed that Bouts left the Northern Low Countries and arrived in Leuven. Art historian Catheline Périer-D'Ieteren disputes this in her recent monograph on Bouts. Bouts produced the Altarpiece of the Virgin (Prado Museum, Madrid) that was viewed as the earliest work that he made in Leuven. He included a number of the typical Boutsian distinguishing traits in it: the meditative, withdrawn demeanor of the principal figures and a strong, realistic presentation with great attention to detail. He marries Catharina van der Brugghen, daughter of a family from a wealthy class, with the nickname Metten Gelde. Together they had two sons and two daughters. Birth of Dieric Bouts junior. Dieric Bouts paints the Triptych of the Deposition (Capila Real, Granada), which belongs with the passion panels such as the Master van Flémalle and Rogier van der Weyden painted them. He used motives to his liking and introduces immobile figures that often were devoid of emotion. Art historian Maurits Smeyers called him ‘the painter of the silence' in a monograph. In conjunction with the rules of the inheritance provisions for the death of his wife's parents, the name Dieric Bouts appears for the first time in the Leuven city archives. Afterwards he was mentioned often in connection with the sale and transactions of goods, and with the orderings of paintings. Bouts paints the Portrait of a Man (National Gallery, London). This is the earliest portrait with a window that looks out onto a landscape. The Triptych of the Adoration of the Magi (the so-called Pearl of Brabant) (Alte Pinakothek, Munich) is made. The name of the work is granted becasue of the perfection and brilliance in this triptych in small format. In the central panel is the Devotion of the Kings. Saint John the Baptist and Saint Christopher stand on the side panels. The family alterpiece originally belonged to the family van ´t Sestich, which owned a house in the Naamsestraat in Leuven. In Christ with Saint John the Baptist and a Donor (Ecce Agnus Dei) (Alte Pinakothek, Munich) Bouts depicts the start of Jesus's public life. In the composition, the landscape also plays an important role. Jesus is portrayed in a very serene manner, a type that Bouts maintains in his complete oeuvre. The commissioner of the works has exceptionally received a place within the composition. Bouts's Virgin and Child (National Gallery, London) is a fine example of how the painter rejuvinated the existing Marian thematic. The observer sees the mother and child through an open window. The child sits on the window bench on a cushion that functions as a connective element. Bouts's motif of the ‘window landscape' quickly spread over the arts in Western Europe. On commission by the Cofraternity of the Holy Sacrament, Dieric Bouts painted the Triptych of Saint Erasmus for one of the two chapels in the Leuven Saint Peter's Church. It is still found there today in its original place. The central panel portrays the execution of Saint Erasmus (+303), bishop of Antioch in Syria. In additon to the two executioners, there are four richly-clad personages from out of history, amongst which is Emperor Diocletian, who had sentenced the saint to death. On the two side panels, two saints are depicted upright: on the right, Saint Hieronymus, on the left Saint Bernard of Clairvaux. The whole composition is rigid and balanced. The contract for the making of the Altarpiece of the Holy Sacrament, also by commission of the Confraternity of the Holy Sacrament, is signed. Because the painting is meant for the usage in the liturgy and to stimulate Eucharistic devotion, the painter receives advice for the execution of the work from two theologians, Johannes Varenacker (+1475) and Egidius Bailluwel (+1482). Bouts is not allowed to accept any other assignments before the completion of the work. Bouts completes the Altarpiece of the Holy Sacrament. The city administration orders from Bouts, around fifty years old, justice panels determined for the Leuven Town Hall, as well as the Last Judgement. For the justice panels there are four large panels provided, and prominent panels are ordered for the Last Judgement as well. The works are to adorn the Town Hall. The paintings must also serve as an example for the judges and lawmakers during their work time. The subject of the justice panels is the execution of King Otto III (984-1002), who did not hesitate to condemn his own spouse to burning at the stake when it appeared that she had falsely accused a count, which had lead to his execution. It is a unique theme in the paintings of the 15th Century. Before 31 January 1470	The Last Judgement is hung up in the Leuven Town Hall. From the city archives, it appears that it is a triptych (there is purchase of the making of hinges and a latch) and the plinth that was made by a design by master architect Mattheus de Layens is an expansive contruction. The central panel is lost today; the two side panels are preserved in the Palais des Beaux Arts in Lille. 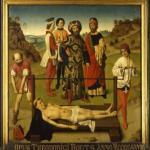 First mention of Dieric Bouts as city painter or master city painter, a title of honour. Bouts completes the painting Trial by Fire, one of the justice panels. .
Catharina van der Brugghen dies and is buried in the Friars Minor Church in Leuven. Dieric Bouts re-marries with Elisabeth van Voshem, the widow of the Leuven butcher Johannes van Thienen and inheritor of his entire estates. Hippolythe de Bertoz (+1502) and his first wife Elisabeth van Keversweyck give Bouts the assignment to make the Martyrdom of Saint Hippolytus (Saint Salvator Cathedral, Bruges). The middle panel portrays the quartering of Saint Hippolytus, the patron of the commissioner. The panel carries through to the right panel with six men, amongst whom are the Emperor Decius who condemned the saint. On the left panel, the commissioners are depicted kneeling. This is the first presentation of donors who are witness to a martyrdom scene. Art historian Griet Steyaert suggests an attribution of the right panel and some areas in the middle panel to Aert van den Bossche. Bouts draws up his testament in the presence of the notaris Jan Amelen, Jan vanden Winckele and stained-glass artist Rombout Keldermans, his brother-in-law. He divides his estate amongst his wife, his two daughters who had entered a cloister, and his two sons, to whom he left his painting amenities, as well as the responsibility for the completion of his not-yet-completed paintings, including one of the justice panels and the Martyrdom of Hippolytus. It is Hugo van der Goes who finishes off the fundamental panel of the Martyrdom of Saint Hippolytus. Dieric Bouts dies. His body is placed in Friars Minor Church, next to his first wife.